(1920- ) Morrell Gipson grew up in South Carolina and now resides in New York City. She is the author of a dozen books for young children and the editor of hundreds of others, including works by the esteemed Margaret Wise Brown, Leonard Weisgard, Ingri & Edgar d'Aulaire and Marguerite de Angeli. 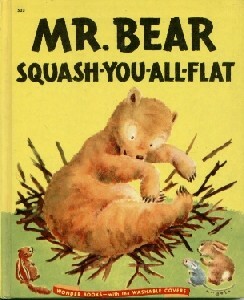 Mr. Bear Squash-you-all-Flat was a very hot item a couple of years ago. 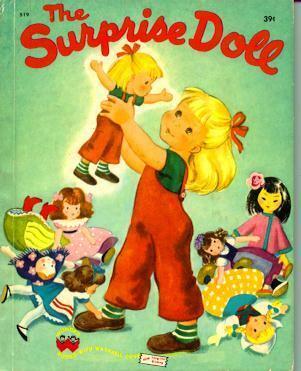 It was originally a Wonder Book in cheap fall-apart binding that most kids destroyed but then were desperate to own again a couple decades later. Gary Larson of The Far Side added to its fame by naming it one of his favorite children's books. But it was so hard to find, and the demand was so great that the price escalated and escalated. Then it got reprinted by Purple House Press in 2000. Now it's easily available for a mere $15, for the next generation to enjoy. The same is also now true for The Surprise Doll. City, Country ABC. Illustrated by Leonard Weisgard. Doubleday, 1946. 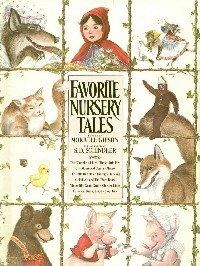 Favorite Nursery Tales. Doubleday, 1983. Hello Peter. Illustrated by Clement Hurd. Doubleday, 1948. *Mr. Bear Squash-you-all-Flat. illustrated by Angela. NY: Wonder Books #523, 1950. Purple House Press, 2000. Rip Van Winkle. Illustrated by Daniel San Souci. Doubleday, 1984. *The Surprise Doll. Illustrated by Steffie Lerch. Wonder Books #519, 1949. Purple House Press, 2005. Clumsy Clown Willie. Illustrated by Paul Mangold. Garrett Educational Corp, 1990. Easter With Friends. Garrett Educational Corp., 1990. Let's Be Friends. Garrett Educational Corp., 1990. Tom's Lucky Quarter. Illustrated by Paul Mangold. Garrett Educational Corp., 1990. The Walkers Go Hiking. Illustrated by Paul Mangold. Garrett Educational Corp., 1990. Whose Tracks Are These. Garrett Educational Corp., 1990.